CheckPrixa MICR E13B Font is a special font that is developed for printing checks with a laser printer and magnetic ink. Magnetic Ink Character Recognition (or MICR) is used in the banking industry for the check payment processing. The funny looking digits found at the bottom of checks can be read by sliding a check through a special machine known as a MICR Reader. When printed in a high resolution printer (600 DPI and above), CheckPrixa's font produces great looking characters that are easily processed by most readers. It is a robust solution for users that require high precision and reliability in the printing process. With CheckPrixa's MICR E13B Font , you can easily automate check printing by incorporating the font into your existing infrastructure. CheckPrixa MICR Font is based on the E13-B check printing standard. This standard is used in United States, United Kingdom, Canada and many countries throughout the world. A major advantage of CheckPrixa's MICR E13B Font over many other font packages is that it can be embedded into PDF or XPS documents without requiring additional licenses. This is useful if you need to store your print-outs for review by approving authorities before actually printing them. You can also send the PDFs to another location to carry out the physical printing. CheckPrixa's Fonts are shipped in a several font formats, making it usable in many environments, including Windows, Mac, Unix, Linux and native printers . Copy the font MICRDemoCheckPrixa.ttf into the /Windows/Fonts directory. 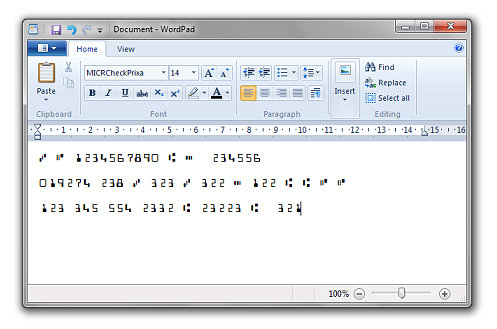 Open a Text Editor such as Word Pad, enter some numbers and choose the font name MICRDemoCheckPrixa and set its font size to 14, and font style to Regular. Note that it is important to make sure the font size is exactly 14 for a proper scan. Note: The Enterprise License also applies to products implemented as SaaS (Software as a Service). 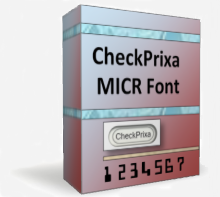 If you have implemented a Saas and would like to integrate and embed CheckPrixa's MICR Font with your product or documents, you may do so by purchasing the Enterprise for either Linux / Unix / Windows. The details of the license can be found at Enterprise License for Saas . Note : The MICR characters are not present in the demo font. COPYRIGHT (C) 2010 - 2018, MICRE13B.COM. ALL RIGHTS RESERVED.